The Imagineers at Disney World have been hard at work coming up with different ways to improve the experience that guests have while waiting in lines for their favorite attractions. They recently have released a video showing what they have created for the new Dumbo The Flying Elephant attraction at the Magic Kingdom Theme Park. The video shows the inside of the Big Top located between the new twin Dumbo rides. While guests wait they are actually given a pager that allows them to proceed to the air conditioned Big Top Tent where they can "play" in the circus themed area or sit while they wait for their pager to let them know when it is their turn to ride Dumbo. So what do you think? Does this look better than standing in line in the hot sun? Here at Only WDWorld we certainly believe that Disney World has taken another step forward towards improving the Pre-Show (aka Ride Queue) part of the attraction. The target age of this area is geared towards the younger visitors, but remember that this is located in the new Storybook Circus section of Fantasyland in the Magic Kingdom. This area more so than any other in all of the Walt Disney World Resort is set up for the pre-school age guest, but we believe guest young and old will long this new addition. 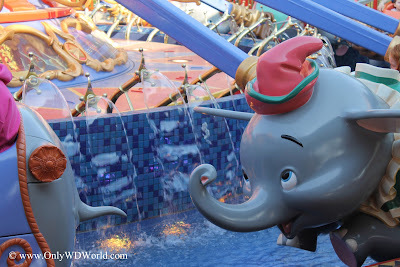 0 comments to "Disney World Introduces Big Top Experience For Dumbo The Flying Elephant"